Mélovin, Tayanna and Kadnay have secured a place into the final of the Ukrainian National Selection. Do any of these 3 new finalists have what it takes to win the competition? The second heat of the Ukrainian National selection show, Vidbir is over. Mélovin won the heat, with Tayanna and Kadnay coming just behind. In the final they will join Laud, The Erised and Vilna in the final who won first heat. Former X Factor and The Voice participant, Ingret brought her unique style and energy to the competition. She performed her song wearing an oversized metallic coat and shorts combo on top of a hot pink body suit. She commanded the stage like a pro and oozed confidence. Ingret was alone on the stage, relying on just herself and the LED display to make an impact. Mélovin placed in 3rd place last year and has decided to try his luck again. The song starts softly and gradually builds up into the chorus. He took to the stage in his signature quirky style and novelty contact lens. Mélovin put in a solid performance with excellent vocals and energy. Half way through the performance, he whipped off his long black jacket and threw away his mic stand. He continued the performance from his piano. At first, the melody was slowed down and then turned into an explosion of energy and vigour which carried the song through until the end. At the end of the performance was a rapturous applause from the studio audience. Julinoza – Khto Ya – Who am I? The song starts with a long piano intro with the first lyrics of the song appearing almost half a minute into the track. Khto Ya has an eccentric feel to it, as does Julianoza and her performance. The song is very light on lyrics with an artistic flare, which added uniqueness and charm to the song. The performance started with blue eye, as the camera panned out we saw Julinoza sat at the piano where she stayed for the entire performance. The eye continued to be a feature of the performance as it was printed on Julinoza’s t-shirt and drawn onto her hand. At the end Andriy Danylko congratulated Julinoza on her performance. Last year’s runner up songstress Tayanna is back for another go. Last year she took the stage with her power ballad I Love You where she narrowly lost out to O.Torvald. Originally Tayanna was meant to be competing her way to Lisbon with the song Kvitka. The song was selected by public vote out of 3 other songs. Unfortunately for Tayanna Kvitka was disqualified as it has breached Eurovision’s rules. According to the broadcaster, Kvitka had already been performanced prior to the September 1st cut off date. A very different song to what she presented last year, Leila is an up-tempo track with a retro twist. Tayanna sings about a girl called Leyla who fell in love with the wrong person, she cried so much that she filled half of the sea with her tears. The song was performed entirely in Ukrainian. Tayanna started the performance with her back to the camera, her blonde hair draped over her orange dress. She was joined on the stage with three backing dancers in nearly identical dresses. Tayanna gave an energetic performance with flawless vocals and received a great response from the studio audience. It was then time for Indie electro-pop duo Kadnay to show their efforts. Dima Kadnay took the lead on vocals with Phil Kolyadenko providing backing vocals and keyboard. Beat Of The Universe is a perfect mix of indie and electro-pop. The group wore some unusual outfits with Dima Kadnay wearing a long black tunic which in some angles looked like he was wearing a dress. In the middle of the song the duo broke out into dance which was well received by the audience. They made the most out of strobe lighting and lighting effects to enhance the performance and showed themselves as excellent contenders in the competition. Then it was time for some, as front-man Yuri Yurko describes as, ‘intelligent-intellectual punk rock’. Stop Killing Love starts off as a good, solid rock song with heavy guitar intro. Yurcash were dressed in beige and brown rags and Yurko’s microphone stand was wrapped in thorns. It was a bizarre performance from beginning to end but thoroughly entertaining and interesting. Mountain Breeze are no strangers to Ukrainian television. They took part in Ukraine’s Got Talent in 2017 and The X Factor in 2016. Mountain Breeze are a young trio from Poltava in East Ukraine. Fronted by lead vocalist Sasha, the band took to the stage, each playing their own individual instruments. I See You has a sweet melody but seemed to lack impact on stage. Last year’s 5th place finalist Illaria was back for another attempt. Illaria brought traditional ethnic sounds to her song. Syla was written by Illaria, specifically for Eurovision because she wanted to inspire people to believe in themselves and overcome life’s difficulties. Illaria performed the song partially in Ukrainian and in English. Ilarria took to the stage in a long white and gold gown and a spectacular gold head dress. Behind her was an ensemble of backing singers, all playing traditional Ukrainian instruments such as the Trembita that some might remember from Ruslana’s Wild Dances. Illaria put in a solid performance with perfect vocals and held a strong presence on the stage. Bom, bom, bom, bom, bom, bom. It was time to party. Dilemma burst onto the screen with their song On the party which brought the first part of the show to a close. The track is a modern floor filler filled with rapping vocals. In the lyrics Dilemma want everyone to wake up and party. As expected, the performance was full of fun, colour and energy, there was even a dancing pink dog! The Ukrainian selection show was once again broadcast from the Palace of Culture in Kyiv. Serhiy Pritula returned as the host and lead the show until it’s conclusion with Ruslan Quinta behind the scenes as the producer. Andriy Danylko (Verka Serduchka) returned as a judge along with 2016 Eurovision winner Jamala. They were joined by new judge Eugene Filatov from The Maneken and Onuka. This year’s French Eurovision participant Madame Monsieur joined as special guests tonight. They performed their French final winning track Mercy. . It was a 50/50 split between the judges and the public televote, which decided the outcome. 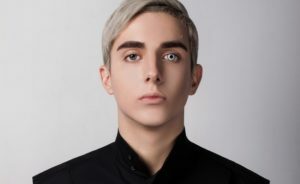 When host Serhiy Pritula invited the contestants back onto the stage for the results it was Mélovin who received the biggest cheer, closely followed by Tayanna. The results were read out, first it was the judges turn to read out their votes with the public votes closely following. It was Mélovin, Tayanna and Kadnay who won the most votes overall and secured their places in the final. Do any of them have what it takes to win? All six acts for the final will compete for the golden ticket next Saturday, on the 24th of February. The winner will represent Ukraine at the 2018 Eurovision Song Contest.